Finished Shattered Souls by Mary Lindsey and it was FABULOUS! A wonderful debut novel from a local Houston writer. Lindsey's novel, set in the Houston/Galveston area, is a haunting combination of history, reincarnation, death and resolution that will have readers clamoring for more. Unlike the usual heroine Lenzie lacks self-confidence (somewhat due to her father's descent into schizophrenia and subsequent suicide), so when a strange young man, Alden, reveals that she is a Speaker and her gift is to help the unquiet dead resolve their issues, she is less than sold on the idea. If Alden is to be believed, then Lenzie is the reincarnated soul of one of the best Speakers in history; a strong, capable woman who Alden has aided for lifetimes. But Lenzie has none of her former memories and she is torn between the life she knows and the one she is destined to live. Will she trust Alden? Will she be able to escape the malevolent force that hunts her? Is she really going crazy? 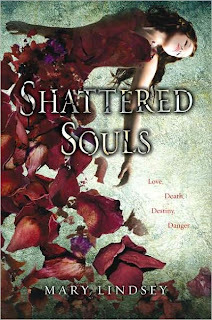 Order Shattered Souls by Mary Lindsey to find out!